There are two different elements to this: first, that I have been feeling a little stuck in my “only AIP recipes” bubble & after 5 years or so here. (Mostly because I’m sick of telling myself “no” whenever I have a fun, non-AIP recipe idea.) Secondly, as an immigrant and non-American living in the US but writing predominantly for a US audience, I have often found myself questioning whether a recipe I love is too “weird” to share here. While I’m definitely not going to stop sharing AIP recipes and feeding that community, I’m allowing myself to expand on the kind of recipes I share here. For the sake of my creativity and happiness, it’s really time for me to make that change because it will allow me to keep feeling inspired, rather than overwhelmed and torn in too many different directions at once. Which is definitely how I’ve been feeling lately. Now, back to the beanless hummus. This take is heavily inspired by the hummus tehina from Zahav chef Michael Solomonov, but using raw cashews as a stand-in for the traditional chickpeas. The garlic is mellowed in lemon, strained and discarded. That means the garlic flavor comes through, without any of the overwhelm that raw garlic can imbue in dips. The tahini is whipped until it’s aerated, glossy and cloud-like. There’s a hint of lemon that doesn’t take over but rather balances and enhances the earthy cumin that is scented throughout. While this cashew version of beanless hummus has a very similar texture and flavor to the classic recipes that informed it, I do find that it is considerably richer than its leguminous inspiration, so I’ll be a little less heavy handed on the portion sizes! Depending on appetite and what you serve it with, this plate could easily serve up to 8 as an appetizer. Because I really love to level up flavors, I topped this beanless hummus with a well-seasoned, spice-rich seasoned beef. It makes for a lovely textural contrast to the creamy hummus, while the scent of the still-warm topping makes this plate completely enticing. So far, this dish is a whole bunch of rich & decadent, so I topped that sizzling beef with tangy, zingy lemon pickled onions. They use very little vinegar, getting most of their flavor from fresh lemon juice, bringing both citrus-y goodness and a hint of acidity that cuts all of that richness beautifully. Also? They’re a simply gorgeous, vibrant color that you’ll have to see in person to believe! This dish is exactly the kind of food I love: bold but nuanced, layered but not complex, adventurous & unapologetic. And I think this place could use a few more recipes along those lines, don’t you? 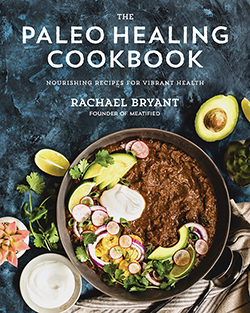 PS – I served & photographed this with the AIP Pita Wedges on p.222 of The Paleo Healing Cookbook. This take on beanless hummus is rich, creamy and laced with tahini, spiked with cumin & livened up with a little lemon & garlic. Classic flavor, no legumes! 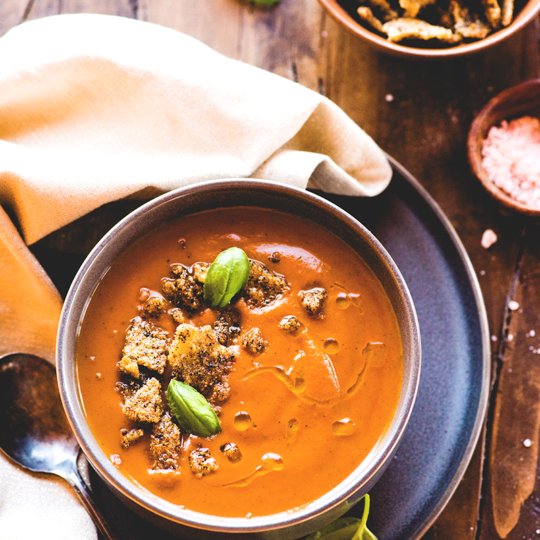 Topped off with warm spiced beef & zingy quick pickles, this is a riot of color and flavors. SOAK: Put the raw cashews into a bowl and pour over enough just-boiled water to cover the cashews by about an inch / 2.5 cm. Cover and soak for 8 hours, or overnight. Drain now cloudy liquid from the soaked cashews and rinse them in a strainer until the water runs clear. Let drain again so no excess liquid remains. CHOP: Pop the unpeeled garlic cloves into the bowl of a food processor, along with the lemon juice and salt. Pulse until the garlic is roughly chopped, scrape down the sides so the garlic sits in the lemon juice and leave to mellow the flavors out for 10 minutes or so. STRAIN: Place a small strainer over a bowl and scrape the garlic & lemon mixture from the food processor bowl into the strainer. Press down with the back of the spoon to squeeze out as much liquid from the garlic as possible, then discard the dry garlic pulp. Add the strained liquid back to the food processor bowl. WHIP: Add the tahini to the food processor and pulse a few times. Using the feeder tube, slowly add the cold water to the tahini mixture with the food processor running, until all the water has been added and the tahini is whipped into a soft, lighter and completely smooth mixture. BLEND: Sprinkle the cumin into the bowl and add the soaked, drained cashews. Process for a couple minutes, until you have a smooth, creamy & light hummus texture. Taste and adjust lemon, salt and cumin, as needed. If you like, you can thin with additional water, too, although I didn’t here. SEASON: Pour the oil into a skillet over medium heat until it just begins to shimmer, then add all of the seasonings other than the salt. Scrape and stir as the spices fry until fragrant, about 20 seconds. Add the ground meat to the pan and sprinkle with salt, stirring to coat with the spice mixture. Cook for a few minutes, until the meat stops sizzling, then begin to break up the meat with the back of a wooden spoon as it releases its juices. Cook until the meat is glossy, browned and any cooking liquid has evaporated, then remove from the heat. ASSEMBLE: Spoon the Beanless Hummus onto a platter, swooshing it smooth with the back of the spoon. Scatter over as much of the warm, spiced beef as you like – I usually don’t use all of it – and top with some of the lemon pickled onions. Drizzle with olive oil, extra tahini, sesame seeds & chopped herbs, if you like. This recipe yields about 1 1/2 cups / 380 g of plain hummus without the meat & extra toppings; feel free to swap this out with whatever hummus you prefer! For AIP, swap the Beanless Hummus for my Garlic & Artichoke Hummus recipe. Omit the cumin, paprika, black pepper & cardamom, swapping out the nutmeg for mace. Add an extra 1/2 tsp each of oregano & parsley, and extra 1/4 tsp ground cinnamon. Add a 1/2 tsp of ground ginger. Pictured above are my AIP Pita Wedges from p.222 of The Paleo Healing Cookbook.